"The mostly legendary Musashibō Benkei's childhood name is 'Young devil child' (Oniwakamaru) because of his enormous strength and violent nature. Legend has it that he was born with long hair and a mouth full of teeth after an extraordinarily long gestation period of three years. At the age of eight he is asked by the monks of the Kaminokura temple to show his strength by removing a huge boulder from a steep hillside. He effortlessly loosens the colossal stone and throws it into the valley below. Out of gratitude, the monks offer him lodging and food. Soon, however, they discover that they cannot handle and undisciplined youth and that his appetite is draining all their financial resources. As a result, they send him to a more severe temple to be raised as a priest. During his stay there he discovers a giant carp at the Bishamon Waterfall. 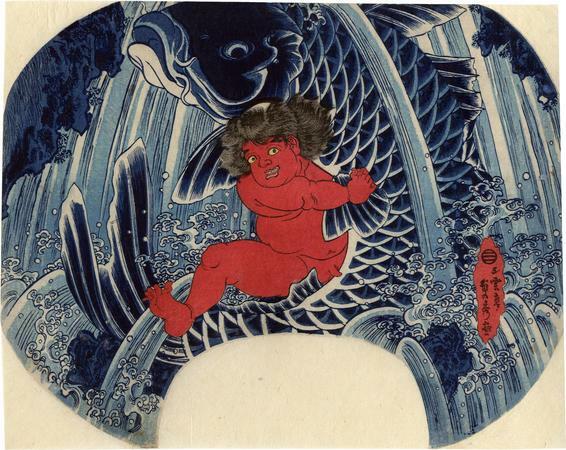 Omiwakamaru cannot resist the challenge and jumps into the water to fight the carp. When he finally succeeds in slitting open the carp's stomach he finds to his surprise the remains of his mother O-Haya who had fallen into the stream years before." Quoted from: The One Hundred Poets Compared by Henk Herwig and Joshua Mostow, p. 60. De Benneville gives a slightly different version of this story. When Benkei was born he was called Shinbutsu, because he was born on the Buddha's birthday. However, the locals soon came to call him Oniwakamaru. Shinbutsu and his mother - the identity of his father is somewhat disputed - were impoverished and barely scrapped by. In fact, his mother O'Haya had a terrible time trying to feed him on a daily basis. After years of struggling Shinbutsu was taken in as an acolyte at a Buddhist temple. His mother was given a hut nearby, but her life was still difficult and everyday she had to go out in search of wood for her fire. One day she wandered off and didn't come back. Shinbutsu was worried about her so he set out to find her. O'Haya had last been seen going in the direction of Tamaki-san. On the slopes of this mountain mass was the Oku-no-in (Inner shrine) of the Hongū temple. Here also was a shrine devoted to Bishamon. Now the place was of exceeding bad reputation, and more than one villager who had wandered that way had mysteriously disappeared. This, of course, was fuel to the flame. Shinbutsu, more and more anxious, pushed his way through the forest, along the rushing mountain stream, and up into the steep cleft leading to the Oku-no-in. Here he came out in a beautiful little glen, at the head of which the stream fell in a series of steep falls and waterslides straight down from Bishamon-ga-take. On all sides the pine and cedar towered over head, shutting out the light, and framing the water in dark and sombre green. Night and day he watched at the place. His scanty provision was already nearly exhausted when towards dawn on the third night he saw for a moment a huge glistening object sweep the surface of the pool. As it was about to disappear, in plunged Shinbutsu to find that he had grasped the fin of a giant golden carp (koi), huge as any that floated in the air on the fifth day of the fifth month at the otoko no matsuri (boys' festival). Fierce was the struggle between them. The fish strove to mount the fall. This at least gave Shinbutsu breathing space, for the plunges of the carp in the pool had nearly drowned him. He was rapidly becoming exhausted, but bracing himself against a projecting rock he succeeded in getting both hands deep in the gills. A mighty effort threw the giant fish onto the bank, where Shinbutsu knife in hand fell on it and pierced its heart. This carp was undoubtedly thenushi of Bishamon-ga-take. To it O'Haya had fallen a victim, perhaps by incautiously entering the stream for some fallen stick. On ripping it up Shinbutsu found in its stomach portions of her garments, which settled all question as to her sad fate. This was a most unfortunate occurrence. The carp was indeed brought home by the wrathful youth, once more converted into Oniwaka-maru. It was buried behind the Wanibuchi shrines in what is to-day known as the koi-tsuka or the carp's tomb, and thus O'Haya found vicarious burial. But Shinbutsu again threw off all restraint, and became wilder than ever. One day he disappeared, and neither Nittai or Kizaemon were particularly sorry when the days passed and nothing was heard of him. He was quite able to look out for himself. Besides, the last real interest had disappeared from Earth with O'Haya.